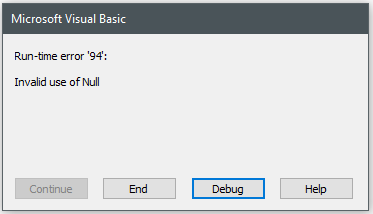 Generally this error shows up when a variable’s or a control’s in an operation has no value at all i.e NULL. Upon further investigation it seemed that the “Me.txtamount” has no value as in some stage the command DoCmd.GoToRecord , , acNewRec resetting the value it contains. sql007 = "SELECT nz(outs,0) AS OutsAmt, outs, uptime FROM SUPPLIERS WHERE [suppid] = """ & suppidVar & """"
As the value of “Me.txtamount” had inserted into database table by the immediate previous operation in the process, hence the value will be populated in a variable from the database table by DLookup opeartion and will be replaced in the place of “Me.txtamount”. In the below code the variable expenseAmt has been replaced in the place of “Me.txtamount”.